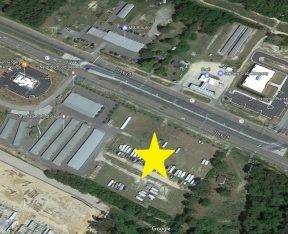 Property sits on 13 acres zoned HI (Heavy Industrial) with 1,966 sf. of office and 10,228 sf. of building located near I-95 Business (new US 301). Call office for showing. Ceiling height in building is 18′. Nine overhead roll doors. Class S pre-engineered metal building.